Five of the 12 Iranian political prisoners on hunger strike at Evin Prison have been transferred to the infirmary, according to the Kaleme opposition website. Abdollah Momeni, Mohsen Aminzadeh, Abolfazl Ghadiani, Mehdi Karimian Eghbal and Bahman Ahmadi Amouyi have been transferred to the Ward 350 infirmary after more than a week without food. According to Kaleme, "the prisoners' families do not trust this infirmary in view of Hoda Saber's fate." Jailed journalist Hoda Saber went on a hunger strike on June 2 to protest what he referred to as "the murder of Haleh Sahabi." He died 10 days later at Modarres Hospital. The doctors announced that he had died from the effects of the hunger strike. However, 64 of his fellow inmates and the opposition say he was severely beaten by prison authorities, who also delayed his transfer to hospital. 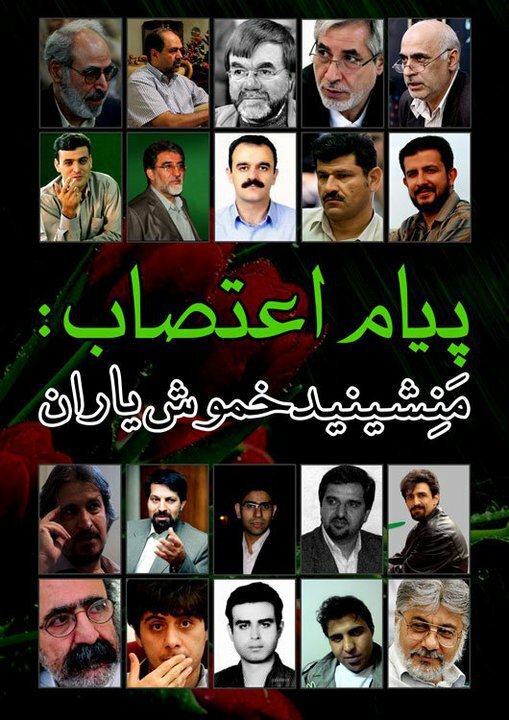 Kaleme adds that the families are holding Tehran's Prosecutor directly responsible for the hunger-strikers' health. They have urged him to transfer the strikers to well equipped and trusted hospitals, so the families can monitor their care and avoid what happened to Hoda Saber. 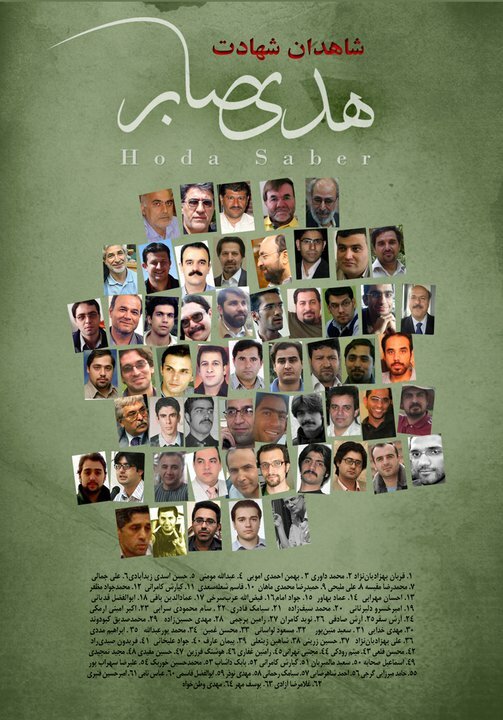 The prisoners began a hunger strike to protest the deaths of Reza Hoda Saber and Haleh Sahabi. Haleh Sahabi, another political prisoner, had been given a furlough to attend to her dying father. She ended up dying at his funeral when government forces raided the ceremony. Meanwhile, six other political prisoners at Karaj's Rejaishahr Prison have also started refusing food in support of their Evin Prison peers. Kaleme also reported that on Wednesday the hunger strikers were blindfolded and taken for questioning but they refused to respond, maintaining that "the use of blindfolds is a violation of their rights." Former Iranian president Mohammad Khatami has called on political prisoners to end their hunger strike and urged the authorities to establish a dialogue with the protesters. The Kaleme opposition website reports that Khatami has written to Feizollah Arabsorkhi, a member of the reformist Mojahedin of the Islamic Revolution Organization and one of the prisoners currently refusing food at Evin Prison. The former president writes: "For many days now, you and several other of our loved ones in prison have been on a hunger strike, and this has made everyone concerned about your health, and some reports strengthen our concerns." Khatami has also urged Iranian authorities to "hold talks with the protestersat the least once in order to resolve the problems." The children of Iranian opposition leaders Mir Hossein Mousavi and Mehdi Karroubi have issued their own joint statement, calling on the political prisoners at Evin Prison to end their hunger strike. Similar appeals have been made by the Islamic Association of Iranian Physicians, dissident senior clerics Ayatollah Bayat Zanjani and Ayatollah Dastgheib as well as several court attorneys.